I am trying to build a process flow to model a combiner that only uses one input port. It should just wait that a specific amount of flowitems enter it to destroy all of the items but one (join). This amount is defined in the machine's label. The problem I have is that I do not know how to collect several flowitems in the process flow without multiplying the amount of Wait for Event. Is there a way to do so, like a "Wait for X item" kind of activity ? Hi @Sebastian The Activity you are looking for is the "Batch" Activity. For the Task you are looking for I would use the "Batch" that releases as many tokens as it has to collect. As soon as all tokens leave the "Batch" I would use a Zone / Resource to allow only one token to move the item on (On Max Wait timer = 0 time -> go another way). With this you only have to go sure, that the first token needs a time to be moved. thank you for submitting your model. I tried using a batch already but it never receives flow item. I created a basicFR, wrote the Process Flow (Event trigger source + Batch + Delay + Release item), added the basicFr in the model and assigned the Process Flow with the instance of the basicFR in the model. Then when I connect the BasicFR to the output of a processor and launch the simulation, no flow items enters the basicFR and the batch in the Process Flow inside my basicFR does not collect anything. Could you explain me what I am doing wrong ? By the way is there a way to link a Process Flow to all the instances of a BasicFR in a model before they are dropped in the model ? receiveitem and releaseitem are essential for a basic FR. You have to call these commands. Thank you ! I saw a similar post but could not understand how it could help me. Now I got it thanks to both of you @sebastian.hemmann and @Jörg Vogel ! Have a nice weekend ! 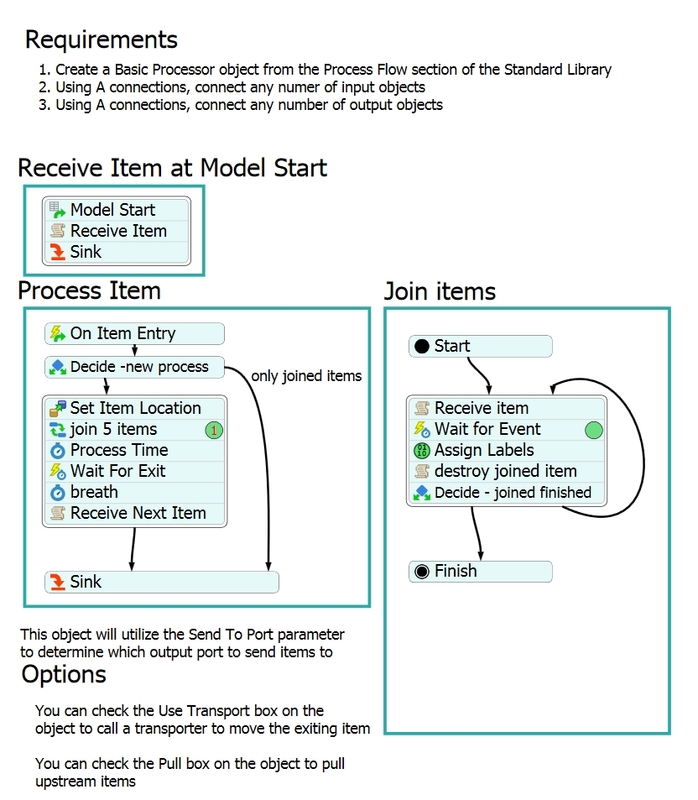 A Process Flow FR Processor can join items and then start processing. The Process Flow Fixed Resource template is enhanced.